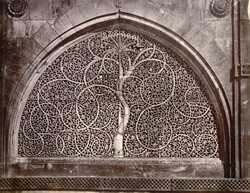 Photograph of an arched window from Sidi Sayyid's Mosque at Ahmadabad in Gujarat, taken by Henry Cousens in the 1880s, from the Archaeological Survey of India. This mosque was built in 1572-3, by a nobleman of the time of Sultan Muzaffar III (r.1561-72) and was once part of the city walls. The mosque is known for the tracery designs in its ten semicircular shaped windows. This is a view of one of the two windows on the west facade carved with intricate tracery in the form of a tree stem and branches. The other eight windows comprise square compartments filled with a variety of patterns.